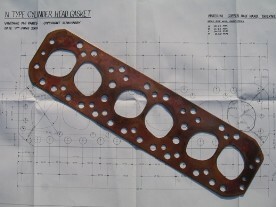 We offer our very own solid copper head gaskets produced in half hard copper of 1.5 mm thickness. Not to be confused with any similar products elsewhere, we utilise the latest CAD production techniques to include water jet cutting and we have these made locally. These are not the hand made/punched gaskets sometimes used on MMM cars and we also lead the way in setting lowest UK pricing. We have referred to original 1930's MG factory gaskets when setting up this project in order to be confident in the accuracy of the profiles we produce. We have also referred to original block and cylinder head profiles to make sure that our gaskets run absolutely flush with the edge profile of the castings. We do however, appreciate that machining datum points can vary from one casting to another although hopefully the images below speak for themselves. Please note that if you are supercharging your car then a solid copper (as opposed to composite gasket) is essential. Irrespective of whether you have a standard or blown engine, the solid copper head gasket can of course be re-annealed and used time after time, unlike the composite gasket with limited reuseable lifespan. In addition, following the switch over from asbestos to asbestos substitute sandwich packing in composites, there is now a high rate of premature gasket failure being reported. With additional problems associated with crimping profiles around combustion chambers, Vintage MG Parts do not associate itself with such products. It is essential that the gasket is double annealed prior to fitting. These gaskets can be supplied double annealed for an additional £10 charge.